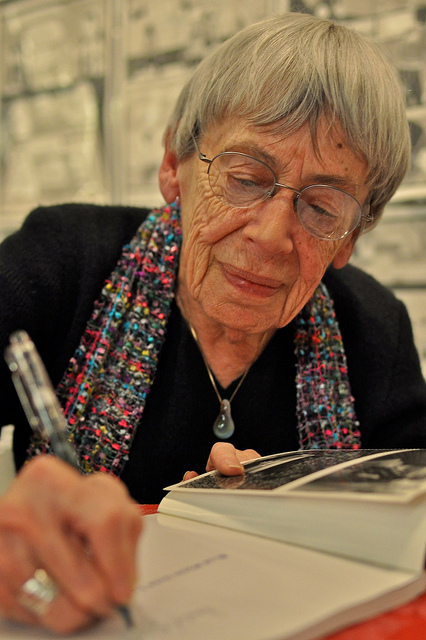 Ursula K. Le Guin passed away on January 22, 2018, and through the comment sections of Jenny’s Argh Ink blog, I found Le Guin’s blog, The Bookview Cafe – one that she shared with a lot of writers, mostly women. The recommended blog post was titled, “Navigation Q1: How do you make something good?” Le Guin started with the very funny (but absolutely practical) advice: “Well, you could start with butter and fresh farm eggs, it’s hard to go wrong from there, unless you are a vegan.” And then she gets serious. Go ahead, take a look if you like. I’ll still be here. If you’ve read the post, then you know how Le Guin spins her metaphor into a textbook souffle – and then gives you permission to ignore those rules if you are making blintzes. That really rang the dinner bell for me. I’m making blintzes, and I should embrace that and make lots and lots of blintzes! From one egg metaphor to another, I found this page about a book of hers that came out last December from Houghton Mifflin called “No Time to Spare: Thinking About What Matters”. The table of contents sold me, especially after reading the blog. It’s an old chestnut that, “wow, I’d read her shopping list!” I haven’t read much Le Guin, but her blog posts were very charming. I *would* like to read about her cat, her “crabby old lady” diatribes, and yes, the section titled “The Narrative Gift as a Moral Conundrum” makes me want to search the internet right now and see if it’s on the blog. I’d better wait, though, and get the real book, and take my time. They call it “dead rock star” effect. It’s sad that it takes a death for me to re-discover what thousands have already known. I might be spending a lot of February, going through Le Guin’s books and other writings. Better late than never, I suppose. This entry was posted in Authors and tagged E.M. Duskova, food metaphors and writing process, Michaeline Duskova, permission to write what you want, Ursula K. Le Guin, write what makes you happy. Bookmark the permalink. Years ago, someone gave me a book that Le Guin had written, but I couldn’t get through it. I didn’t read fantasy at all at the time, but I read more now, so maybe I could get into it. Also I know she’s written in other areas, so there will be something out there that I like. I really enjoyed that rejection letter she sent her publisher that’s been making the rounds on the internet. And what do she and I have in common? I also wrote a book called No Time to Spare. I wonder if she did a google search on titles and found mine? What an interesting coincidence! I read a couple of books by her that crossed my path, but I know of her more than I know her work. She inspired so many people! I’m the same – I know of her more than I know her work. But I did follow the link in Chuck Wendig’s blog to a short story of hers: Those Who Walk Away from Omelas. More a vignette than a story, I’d argue, but wow, it sticks with (or should I say, haunts) you after you’ve read it. Oh, thanks, Nancy! I know what I’m doing on my lunch break!